I haven't made any posts lately, it's been quite a bit since my last one. But who can blame me, with a surge of new, enjoyable games coming out? Portal 2 has kept me busy, what with the multiplayer addition adding more hours of gameplay. Fable 3 is fun, but after becoming King/Queen there's not much to do, except if you know where all the quests and hidden stuff is. The Witcher 2 is a "will buy" game, will be getting that in the near future. It looks well made with an intriguing story, so it should be worth it! Making (or composing) music is another thing I have been trying my hand at, so far only small little loops, but it's really fun to do. FL Studio is the program I'm using at the moment, it's fantastic. While browsing the web I came across a service named Duolingo. Duolingo comes from the makers of Captcha (so you know it's gonna be good). It's premise is simple, you are given (when you first start) a very simple sentence or word in your chosen language you want to learn. Gradually these will get harder and complex. This helps you to understand and learn the language but it also helps Duolingo translate the Web. That's right, they're aiming at translating the Web. It's currently in the private Beta, so you need to apply to get access when it launches. So yeah, it's gonna be a while before I churn out anything that will work. "Have fun trying to sleep now." It doesn't have any new features, so I doubt it will take off. Though it will probably be touting the new Symbian^3 OS "Anna". Oh geez, talking about the Anna update.. The Nokia C7 and E7 (both released AFTER the N8) have gotten the Anna update, whereas the N8 hasn't. This is outrightly stupid. Why? Nokias N8 is their current flagship, yet their support for it is horrendously horrifying. Not even a hint for a release date, just speculations about it coming out in Q3/Q4. We can only hope that they're fighting with a big bug or a flaw and that they're not just sitting around. What the hell is wrong with that phone? How in the world did you burn it? Portal will keep you busy. Checked out the duolingo, seems cool. I'm trying to learn a foreign language right now. I agree - there's a lot of great games coming. Impossible to find time for everything in your daily routine. Are you going to write about the upcoming E3? I liked the song on that. I'm gonna buy Portal 2 as soon as my exams are all over :)! Portal 2 was really fun, but short and not much replay value. Me and my bro blew thru it in an hour or two (co-op) Singleplayer was done in just a day. Duolingo sounds great! That barbie-nokia video was pretty crazy indeed. Oh god, I'm going to have nightmares from that video. my friend swears by witcher 2, can't wait to check it out. There's so many games coming out this year it's gonna be harsh on the wallet. I only had one Nokia phone, can't say I'll try them again any time soon. I remember trying Fruity Loops when I was younger, could never get anything decent going besides drum beats though. 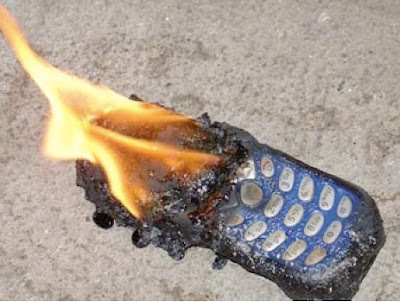 that burning phone looks crazy awesome haha. nice info on games though, i really need to get a copy of portal 2!